So, everyone knows the story about Corrigan's in Houston. Two guys walk into local watch dealer Corrigan's, furtively buy a few chronographs, walk out, and then take them back to NASA, where they're subjected to 200° F temperatures and 40 G shocks and only the Speedmaster comes out of it keeping time, and ends up flown up on Mercury and eventually Apollo. No one knows anything about it at Omega until they see Ed White in June 1965 floating a few hundred miles above Cape Canaveral, wearing a Speedmaster outside of his G4C suit. There's an interesting document on page 600 of A Journey Through Time that's a bit hard to read, but you can make out most of the text with a fair bit of image processing. It's a quote request sent in 1964 to Norman M. Morris Corp, which was the exclusive agent for Omega in the United States for two (or maybe 12 - see below) chronograph watches. This is probably the order referred to in the above Omega press release, but to preserve a good story, they're vague enough to make this order sound as anonymous as those guys at Corrigan's. It is the intent of the Government to procure two (2) each chronographs from six (6) different manufacturers for test and evaluation purposes. In the event that sufficient responsive quotations are not received, the Government reserves the right to award all or any part of the total requirement as may be in the best interests of the Government. Required on or before October 21, 1964. The NASA will accept quotations from your local dealers. It's either 12 Speedmasters, or if it's the same document as Omega mentions, it might just be a generic message indicating 12 watches total from six manufacturers, so 2 Speedmasters. In any case, $82.50 each, which seems about right for the mid-1960s. 1. NASA agents purchased some number of watches from Corrigan's, but whether due to the need for a larger sample to test or to compare random retail watches with dealer-supplied watches without any special obfuscation, more were needed for the tests. 2. The Corrigan's watches or these watches were used for a different set of evaluations or not used. 3. The Corrigan's story is not true and all the watches were ordered in fall of 1964. This would seem to cast down on the oft-repeated statement that Omega did not know about the Speedmaster's role in the space program until Ed White's Gemini 4 EVA. That is: 1. NASA is contacting Omega directly here, or close enough. 2.NASA certainly ordered a fair number more Speedmasters to equip its astronauts for training and use, eventually many dozens. 3. It probably did not do this in secret. So, at best Omega probably had a pretty good idea prior to June 1965 that their watches were being used for space by NASA, if they did not already know. The big advertising push really gets off the ground after Gemini makes all the magazine covers, and there doesn't seem to be anything before it. Maybe they just wanted to be sure. Or maybe they just wanted to wait for better visuals? Last edited by ASRSPR; February 10th, 2011 at 00:03.
watch_geek2014 and 2535.80 like this. Interesting! For all the discussion of various Speedmaster references flown and worn on the Moon, I don't know that I've ever seen anything identifying the exact models tested. Obviously (I think) we're talking about 105.003 models, but from which year? Ah, the mystery of the Speedy Pro deepens. Thanks for the post. I wonder what Chuck knows about this now that he has crossed over. I believe that the sending agency is "Gemini 4 Flight Support Procurement Office". This would make sense, as Gemini 4 was to be the first American spacewalk. Source: John F. Kennedy Space Center John F. Kennedy Space Center - The Gemini Flight Summary This is the White spacewalk wherein some Omega exec spit out his coffee and said "That's a Speedmaster!" Unless Norman Morris was an authorized rep for six different Swiss watch lines with chonographs, I read this as a form request for quotes, which they carbon copied and sent out to six different dealers (note all of Morris' information is handwritten on the form specifying "Omega", while most of the other terms are typed). Presumably, there are five others out there, with the names of different authorized dealers ("Rolex", "Bulova", etc.) handwritten in. This still does not mean that Omega "knew" in advance. This isn't even a purchase order for a watch -- it's a request for quotes. Assuming my above supposition is correct, Morris would have been well aware that NASA was asking for quotes on other watches, so a little early to ring alarm bells. Additionally, the form says nothing about a spacewalk -- for all Morris knew, they were pricing watches for the ground controllers or something equally unglamourous. There would have been no need for him to breathlessly inform the upper echelons. Co-branding Omega with the space race hadn't become habit back then. Nor does this necessarily pour water on the Corrigan's story -- that might have been the first attempts at testing. Engineers love to do test more than once. I believe that the sending agency is "Gemini 4 Flight Support Procurement Office". Now that it's not in the middle of the night, it definitely looks like you're right with the proper amount of squinting! Thanks! I agree. Certainly, the request for quotes for (and presumably the subsequent acquisition of) two Speedmasters is insufficient evidence that Omega or its agents knew anything of NASA's plans. But it is as close as we can get to certainty that these were not the only watches purchased by the time of Gemini 4. Certainly, after the March 1 certification of the Speedmaster, NASA must have ordered more of them - enough at the very least to equip the crew and backup crew for Gemini 3, the crew and backup crew for Gemini 4, and some training spares. I suggest that it's not a stretch to believe that they would have acquired may enough to equip the rest of the Gemini flights. Certainly, it seems reasonable that no one at NASA called up Morris or Bienne and told them that they would going to be sitting on a marketing bonanza (I'm frankly surprised that they have what mission it is in the address). I'm not suggesting that. I only mean that perhaps they were not taken completely unawares as to warrant expression of coffee. Monday: Hi, Omega? It's NASA. Listen, we need to do some tests on a few watches. Send us two, okay? Friday: Hi, Omega? NASA again. We're going to need two dozen more watches. I'm sure they could put two and two together. At the very least, the popular narrative is one where subterfuge was used to explicitly hide NASA's acquisition of the pieces - watches are bought at Corrigan's, maybe through some other unspecified means, tested, and then just show up in Space. It's a narrative that Omega has perpetuated because it makes them look good. And while most of it is supported by facts - the torture test, the Speedmaster's success - this order suggests at least some parts of this narrative are overwrought. I agree! I think that my scenario 1 is the most likely. The only thing is that I think that this popular anecdote has manifested here and there as a telling where Corrigan's watches were the only ones that were tested. As this stands, it's not entirely clear that they were tested at all. In any case, it's worth noting that at least two Speedmasters were requested for testing 2 years later. My impression was always that the incognito purchasing of off-the-shelf chronos was not so much to avoid giving an advertising bonanza to any particular manufacturer as much as hoping to avoid their own lengthy manufacturing and testing process. "Look, before we try building our own, grab a couple off the shelf and let's test them. If it doesn't work out, we're out the cost of a couple of watches. If it does, we'll run another series of comprehensive tests and pitch it to the brass that we're better off buying what's already available". This is all speculation on our part, of course. It's half a century later, and anyone who was in enough authority to speak on this, whether at NASA or Omega has long since died or forgotten. I still think your scenario #1 is the most likely. I also think that they would still have had to purchase more Speedmasters after the Corrigan's bit, because any test that would utterly destroy products from Rolex and the other competitors would have left the Omegas perhaps still working, but in no condition to be issued to anyone. As to whether Omega was ignorant of the significance of the purchases: I would point out that the whole idea of a commercial/advertising advantage to the space program would not have been in anyone's mind in 1964. I've grown up with the whole "Drink your Tang, it's what the astronauts drink" bit, but that didn't get off the ground until later. Just because they were aware that NASA bought some of their watches doesn't mean they knew they would be going into space. As a supporting circumstance, I'll offer the fact that the Omega Speedmaster was the only item used in the program that the average citizen could purchase -- everything else was built/contracted by NASA. Pretty much still is. (Yes, I know... the Fisher Space Pen. That didn't come along until later, and Fisher approached NASA, not the other way around). It just seems to me that if Omega has even the slightest inkling that their product would be used front and center for the space program, they would have waived the $82 fee. In fact, I'm failrly certain that the last batch of Speedmasters NASA aquired was sold to them at a special price of $1 each -- no wonder they bought enough to fill a cabinet in Coco Beach somewhere. Finally, even if the method by which NASA selected the Speedy was not quite as romantic as they would have you believe -- the fact remains that Omega built a watch -- without even meaning to -- which was tough enough to be selected. Bulova mounted two successful attempts to have the watches re-evaluated (Swiss watches wouldn't meet the "Buy American" initiative unless there wasn't a domestic alternative available), and the Speedmaster was selected each time. AJTT says "1 cent each" for the 56 they bought after the 1978 tests. And there was something about them moving Speedmaster case production to the US after 1972 to avoid running afoul of Buy American. AJTT says "1 cent each" for the 56 they bought after the 1978 tests. At that price, I'll take an even dozen! Just want to post here to deepen the mystery. A recent post in the G-shock forum ( https://forums.watchuseek.com/f17/wha...l#post11182994 ), brought me to do more researching on this subject. Here are a few unanswered or unconfirmed questions I have. Notice the picture above in Post #9, there were 2 watch straps on Edward H. White II's left wrist. No watch was visible on the strap closest to his hand. One watch was visible on the second strap from his hand. That was the watch that's widely known as the first watch ever worn in outer space, both outside the space vehicle and outside the space suit. It was widely considered to be an early model of Omega Speedmaster. 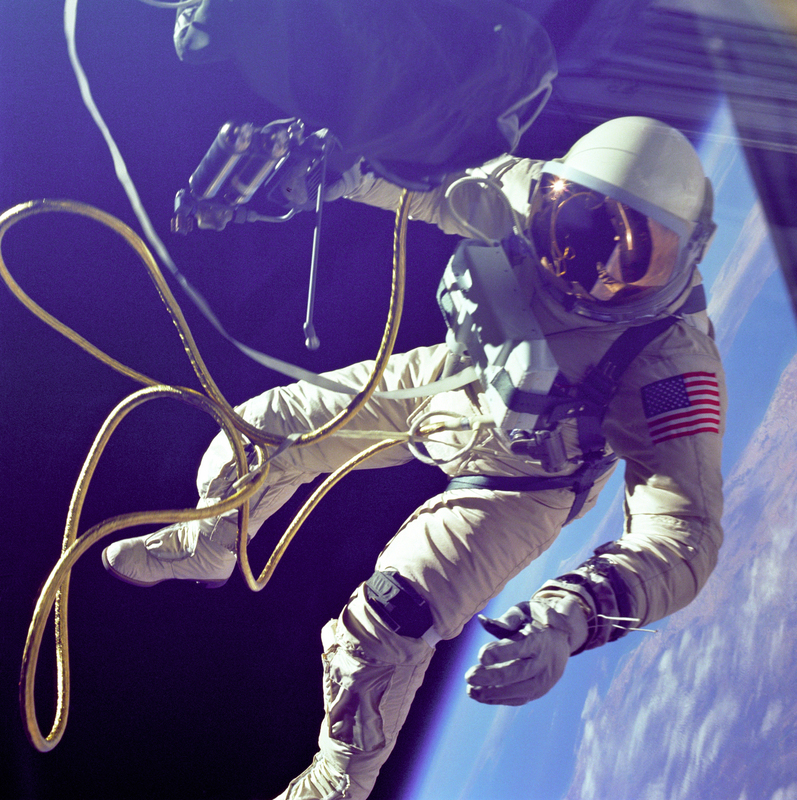 Here's another picture I've found from the NASA website, which clearly showed not 1, but 2 watches on Ed White's wrist on that day June 3rd, 1965, when he made the 1st spacewalk for Americans. Again 2 watches! So the question come, were they both Omega Speedmaster, or only 1 of them was? If they were different watches, what was the other one? How in the world Omega co. was able to tell it was a Speedmaster by looking at a magazine photo? Remember it was 1965, there weren't any high definition digital photos we have today. The Gemini 4 EVA photos we've seen today in websites, including ones in my post and in Post 9, were likely digitally remastered and enhanced. Yet, it's still very hard to tell with 100% certainty what watch... or rather watches were on Ed White's wrist. It's also evidenced that very few back then could tell it was 2 watches on Ed White's wrist, not just one! There was a claim that Ed White also wore the same watch (one of the two wore in EVA), to the Apollo 1 testing, which unfortunately caught fire killing him and two other astronauts. In addition, the watch was also claimed to be able to survive the fire and was given to his family. Here's a webpage / article I've found featuring a picture of the said watch and a letter supposedly from his son, Edward H. White III. Can someone confirm the authenticity of this claim? I found a chart in a NASA webpage that loosely confirmed the watch was in Apollo 1 and was presented to Ed White's family. Look at the chart at the bottom of the webpage below. Also notice the chart did not mention how many watches was given to Ed White for the missions, only confirmed the case reference as 105.003. Was it the same watch given to his family that was burned, or was it a different one? I need another confirmation on this.